NANAIMO – There are few events as diverse as the Certified Organic Associations of BC (COABC) conference each year. Large and small-scale farmers spanning the spectrum of different crops, livestock, regions and experience, they are connected by a commitment to organic production systems. With the theme of ‘Relationships in Transition: Land, Livestock, Waterways and Community,’ this year’s conference in Nanaimo, February 24-26, covered topics ranging from perspectives on indigenous food systems to succession planning, traceability and pasturing chickens. One of the most significant transitions discussed at the conference was the province’s new mandatory organic standard, which comes into force in September 2018. The BC Ministry of Agriculture is supposed to be leading outreach to industry about the regulation while COABC is focusing on providing the tools and information that producers need to make the transition. The Food and Agricultural Products Classification Act was introduced in February 2016 and passed in December. The new regulations seek to increase clarity for consumers after seven years of confusion around the term organic. The confusion was created by a loophole that allowed food to be sold as organic within BC without having to be certified under a provincial or national certification program. BC’s organic industry has pushed for clarification and the new regulations have been welcomed by COABC. Under the new regulations, uncertified producers marketing food as “organic” will face the possibility of penalties, including a $350 fine. The regulations come into effect in September 2018, allowing time for interested growers to make the transition. COABC is encouraging their members to mentor growers interested in getting certified. COABC has also been developing the Organic Online System, an online database that will help new entrants achieve certified organic status. The tool is expected to save farmers time by providing a more efficient and streamlined process and will also be used as a source for gathering comprehensive statistics on BC’s organic sector. While the online tool is being developed, COABC is working closely with the certifying bodies to make sure they have what they need to manage increased demand leading up to the September 2018 deadline. Growers interested in transitioning to organic can find resources on the COABC website [www.coabc.ca]. One of the other transitions that was not on the program but still came up at the conference was the issue of public trust. 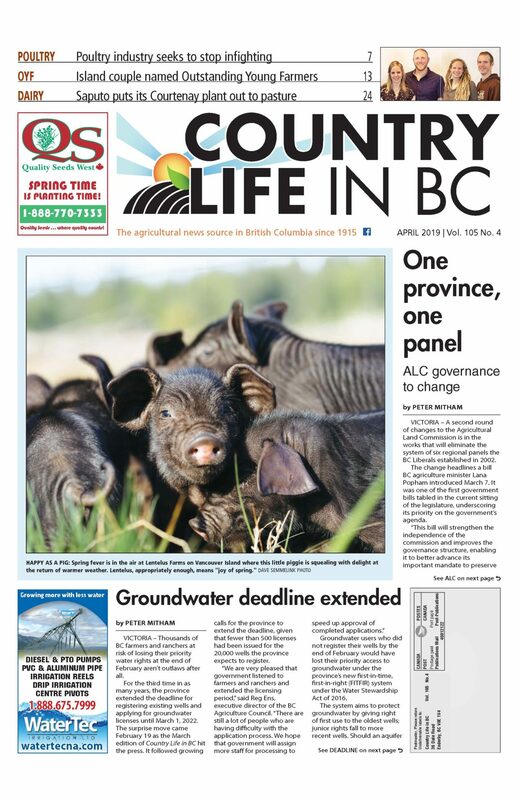 The COABC board has decided not to pay the BC Agriculture Council’s special member levy for a public trust campaign. Despite COABC’s decision not to support the initiative, Wakeling stills sees value in the work, albeit from a slightly different point of view. “Public trust is a good thing to pursue. It’s very much about consumer confidence with food, and it’s important to work continuously on improvements and transparency in our food system,” she says. “I accept that people in the sector want to improve, and I hope that’s what this work will bring – long-term improvement to the environmental practices and social practices in agriculture.